Most people fall in love with Sugar Fix Dental Loft because of the ambience and personalized service they receive when they are here. Dr. Emery has created a gem of a practice here in Chicago. She holds very high standards in herself and in her team; she sends us to different courses for continuing education all throughout the year, she shares up-to-date videos and journals for us to read, and she also has us participate in a monthly book club with her. Each month, the books vary from dental information, business trends, or even personal skills. Dr. Emery purchases the books for all of us, and then the book is ours to keep. We can take notes directly into the book or earmark pages that are significant to us as we’re reading the book, which also helps us to contribute to lively discussions. This might make you fall in love with Sugar Fix Dental Loft even more- Dr. Emery is incredibly creative; you know this because of her gifted dental work. But, you may not know that she is the brainchild behind all of her advertisements, social media postings, Sugar Fix’s awesome new website, and blogs. Daily, she encourages all sorts of creative ventures from her team. Whether we’re writing blogs, or finding new & creative material to research or learn about. Additionally, she encourages us to seek out creative and healthy activities outside of our work at Sugar Fix. This book completely supports that. Gilbert discussed her trials (as well as those of many others) of navigating the creative path she’s chosen in her life. As a team discussing this book, we all felt like we could relate easily to Gilbert’s words and stories as we’ve all tried and failed at various things in our lives; Dr. Emery included. 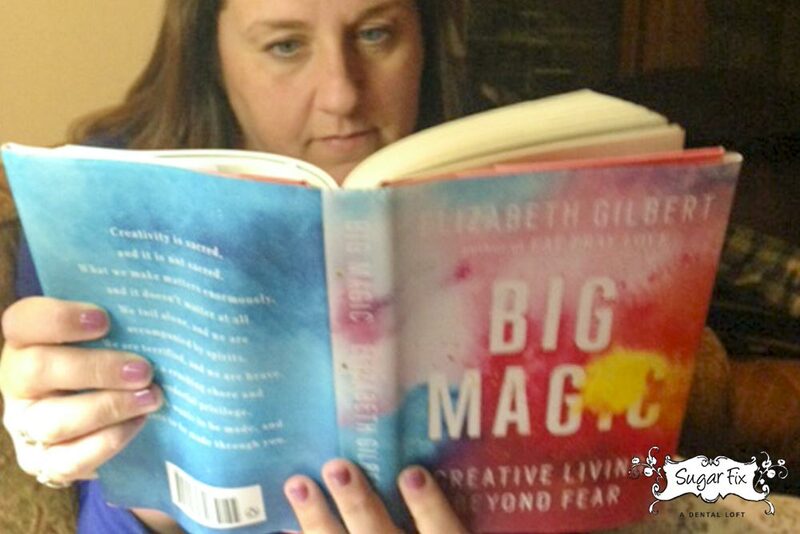 Dr. Emery wanted us to be sure to take away from this book that we can’t live in fear of possible failure of creativity’s magic; that she wants us all to pursue more creative ventures through Sugar Fix & personally. In that spirit, I suggest you keep your eye out for our new creative adventures from Team Sugar Fix. 2016 is right around the corner, and our sights are set for big magic at the Loft!